As well as a successful author, Kay Williams (left) is a professional actress who has played a wide range of leading roles at theaters around the U.S. For several years, Kay worked behind-the-scenes with Jack O'Connell*, an independent filmmaker in New York, traveling with him to Leningrad in 1991 where she received the idea for The Matryoshka Murders. Anything could happen here, she thought, in this city at this desperate time. 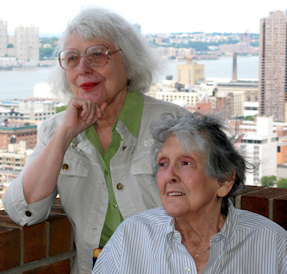 Eileen "Jo" Wyman, Kay’s writing partner (right), helped organize photos and notes collected from the trip, and together they drafted a plot and wrote this thriller that begins in Russia and jumps across an ocean to New York City. Eileen, known to friends as Jo, an amazing, talented woman, tragically passed away on Sept. 6, 2013, just after The Matryoshka Murders was completed. Jo worked in radio-TV and began her writing career in comedy, crafting jokes for speech writers and comedians, humorous fillers for magazines, and captions for cartoonists. She loved humor—from punch line jokes to surreal comedy to wit and word play—filling file box after file box with her wry, pithy descriptions. The authors’ move into the crime-ridden, sleazy Hell’s Kitchen of 1977 provided the catalyst for their award-winning thriller, Butcher of Dreams. Kay’s wide ranging acting credits and theater experience gave focus to this character/plot driven mystery that centers around the struggling 42nd Street repertory theater where much of the action takes place. Kay is also a co-author of the comic romance One Last Dance:It's Never Too Late to Fall in Love, started by her journalist father Mardo Williams, and finished by her and her sister Jerri Lawrence. One Last Dance has won several awards, including an Ohioana Award (to Jerri and Kay) for writing and editing excellence. Coming next (dedicated to Jo) - Part One of a Series: New York City, Collected Letters, 1956-57: Were We Ever That Young?, the hilarious, heart-breaking and hair raising adventures of two starry-eyed girls from the Midwest (Jo and Kay) who arrive in NYC with big dreams of success. Part Two of the Series will be San Francisco, Collected Letters, the Sixties.